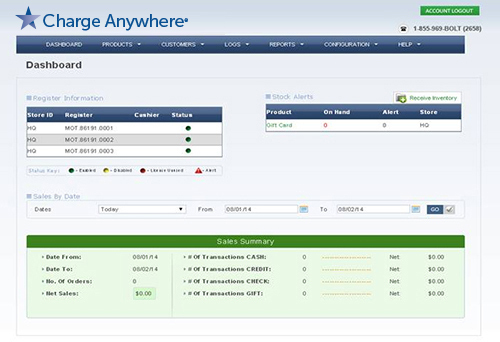 Charge Anywhere’s QuickSale POS is a dynamic cloud-based cash register and retail management system that provides the latest in point-of-sale functionality and business management tools. Our cutting-edge features are designed to give business owners a competitive advantage, and our Android application, powered by the cloud-based back end that is multi-user and multi-location friendly, allows for convenient management from anywhere with internet connectivity. 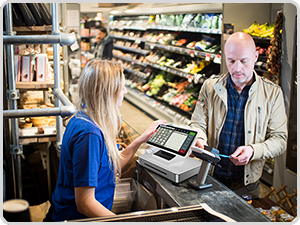 QuickSale POS benefits merchants of all types from retail storefronts, supermarkets, and concession stands to mobile pop-up stores and anything in between. 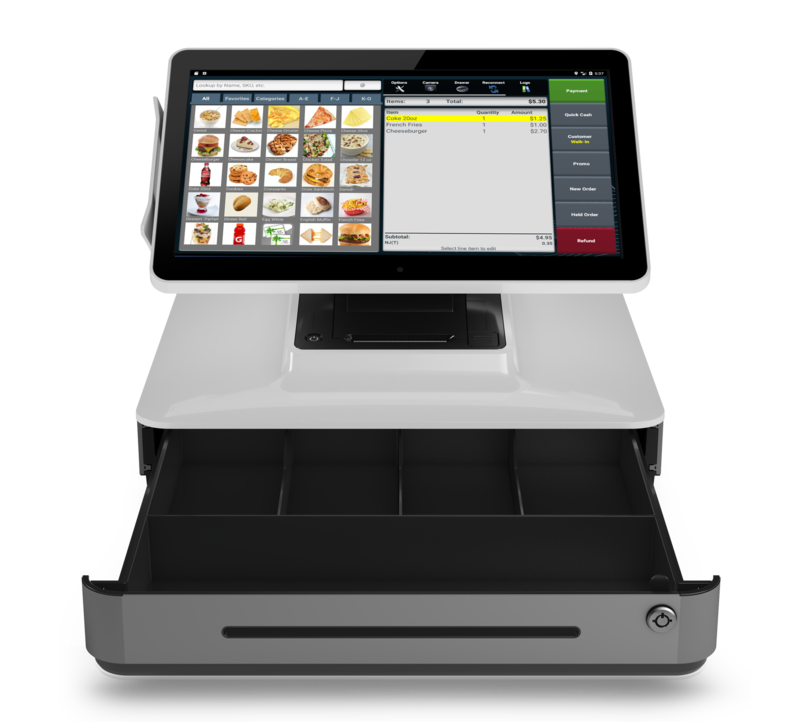 QuickSale POS supports multiple preconfigured hardware bundles based on merchant need. Merchants can add hardware options to the bundle, enabling them to create their own customized solution. Our hardware bundles are easy to install and our distribution partners provide both setup and ongoing customer support. Bring Your Own 7” or 10” Android Tablet. 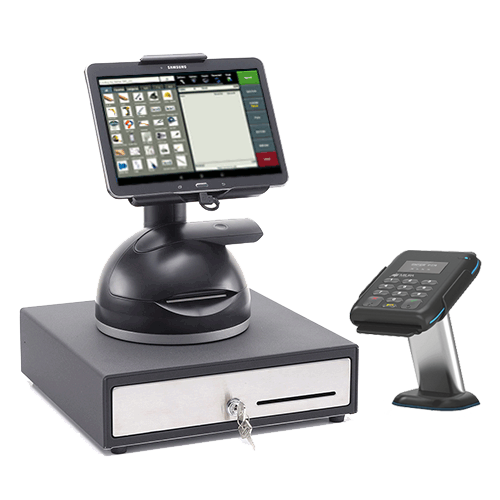 Our BYOD EMV bundle includes a Tablet Stand, a Battery Powered 2” Receipt Printer, a Bluetooth EMV Chip/Mag Stripe Reader with PIN Pad and NFC for contactless/tap payments and a USB charging cable. 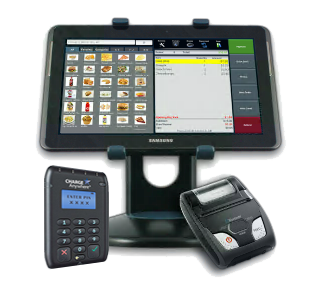 The T25 incorporates all common retail peripherals (including an optional 7” Android Tablet, 3” Receipt printer, 2D Bar Code Scanner and a Bluetooth EMV Chip/Mag Stripe Reader with PIN Pad and NFC) into a single, secure, elegant and ergonomic form, requiring less counter space and reducing costs. All of this with just one power cord. This system combines an ultra-small footprint, sleek look, ease of use, and highly integrated features into one simple and elegant solution. 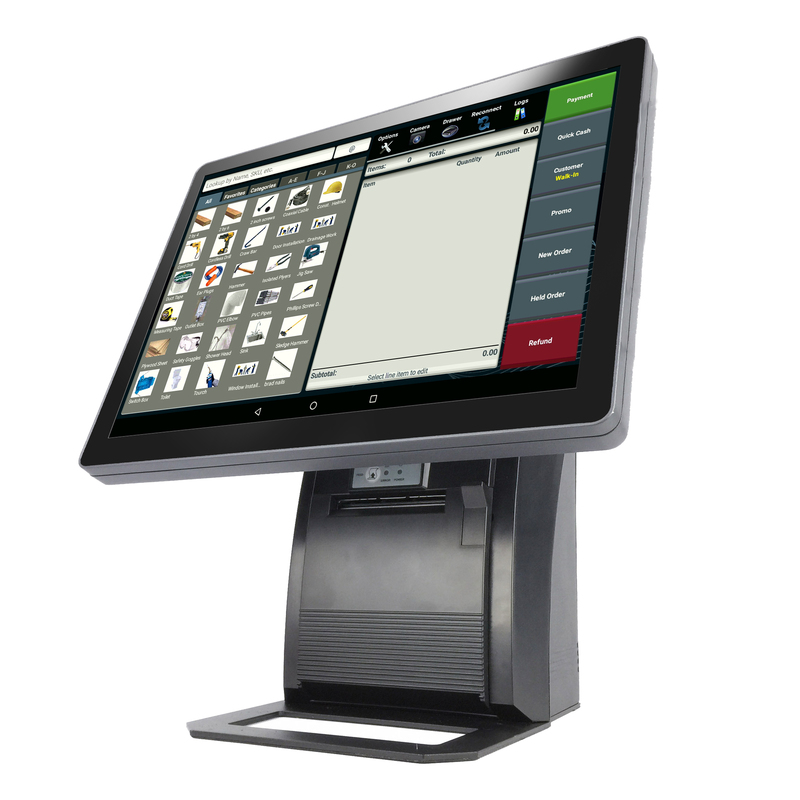 This Android A1088 features a 10” tilt projective capacitive touch screen, a 2 1/4” Receipt Printer, Customer Display and a Bluetooth EMV/MSR reader with PIN Pad and NFC for contactless/tap payments. The bigger brother to the A1088, which means it packs the same fast components and small footprint as before, but now with a bigger, expansive screen. 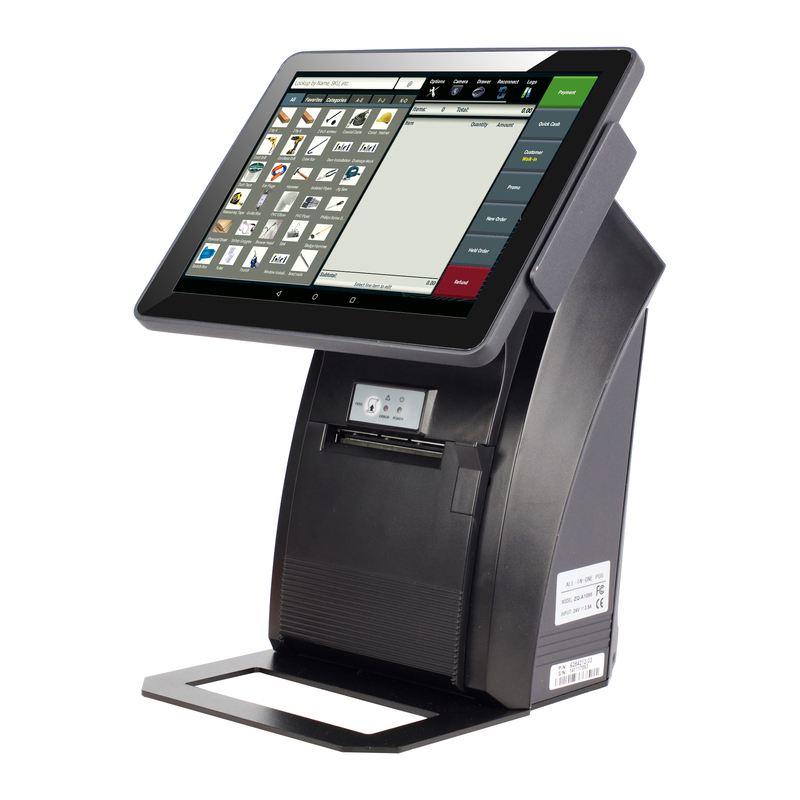 The A1088 Max features a 15” tilt projective capacitive touch screen, a 2 1/4” Receipt Printer, Customer Display and a Bluetooth EMV/MSR reader with PIN Pad and NFC for contactless/tap payments. Intelligent, compact and portable Android Cash Register with 11.6” Screen, 3” Receipt Printer, QR Code Scanner, Camera, Customer Display and a Bluetooth EMV/MSR reader with PIN Pad and NFC for contactless/tap payments. 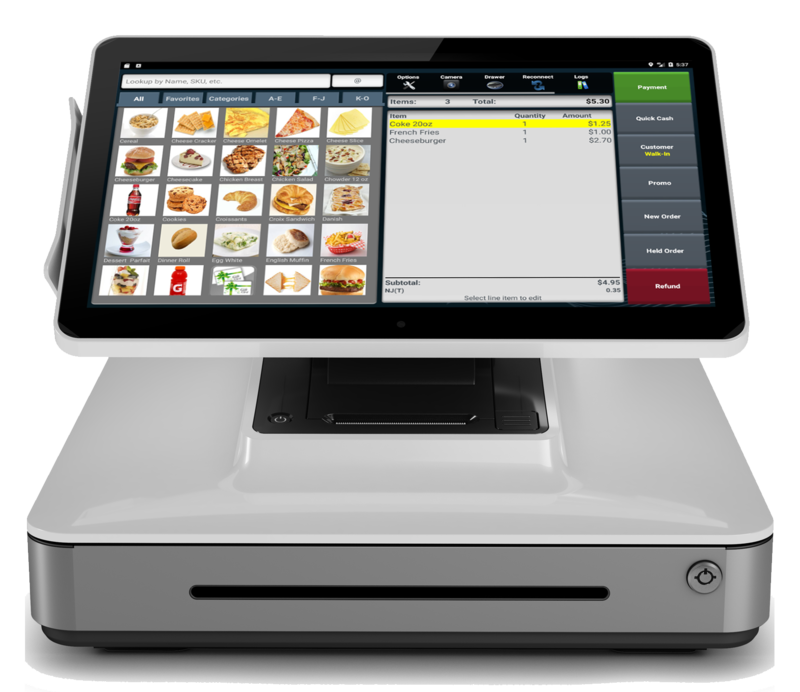 All-In-One Cash Register includes a 13.3” Android Capacitive Touch and Tiltable Screen, a 3” Receipt Printer, Customer Display, Cash Drawer, 1D Bar Code Scanner, a Bluetooth EMV/MSR reader with PIN Pad and NFC for contactless/tap payments. All of the great features of the Paypoint with a larger 15.6” Android Capacitive Touch and Tiltable Screen, a 3” Receipt Printer, Customer Display, Cash Drawer, 2D Bar Code Scanner, a Bluetooth EMV/MSR reader with PIN Pad and NFC for contactless/tap payments. At Charge Anywhere, we realize that no two businesses are exactly alike. That’s why as a Charge Anywhere customer, you’ll get to choose the software and hardware that best fits the needs of your growing business. Choose from two strategically-developed software packages we’ve created based on the most common requests from our customers. Questions about choosing the optimal software for your company? Contact us today – our experts are here to help.